Thanks to Ida Walker from The Enabling Cook for guest blogging with us this week! Ida is sprouting wheat berries and leads us through the process, step by step. For many of us who bake our own breads, the next logical step is to grind our wheat into flour. And once we start grinding our own, it’s on to sprouting. Many of us sprout pea shoots, mung beans, radish greens and the like, but we may not have thought about sprouting wheat berries for our flour. Though I have to confess my motivation for trying many things do not revolve around health benefits. But if I can get some benefits, why not? 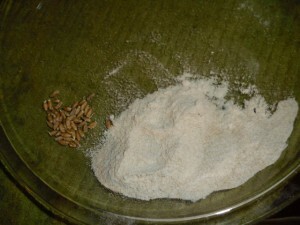 Nutrients, like vitamin C, are added when wheat berries are sprouted. 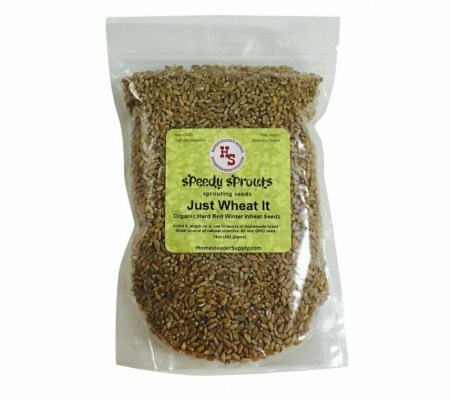 Some people who have difficulty with wheat find products made with sprouted grains more tolerable. According to some experts, whole wheat or partial whole wheat bread is fluffier when made with sprouted grains than all regular, whole wheat flour. You’ll want hard red or white wheat for bread. 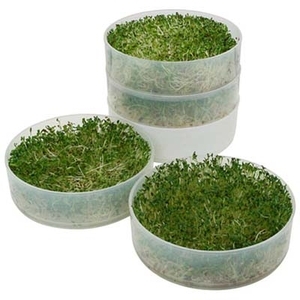 Our four tray sprouter is economical and handy. 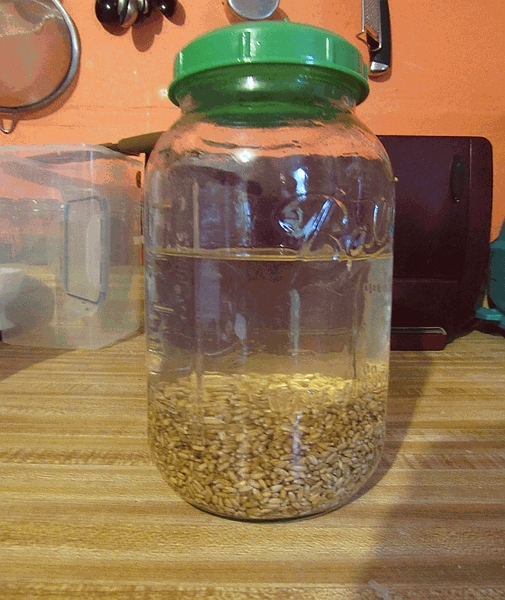 Sprouting wheat berries, then making flour! Once the berries are dry, there are 2 options. You can put them in an airtight container and freeze them for later grinding. Or, if you’re like me and figure you’ve waited long enough, grind away! Use your grinding implement of choice. If you’re using an electric mill or blender, the berries will get heated in the process. Many, including me, put the berries in the freezer for a while before grinding. This process was fun. Seriously. The hardest part was waiting for the seeds to sprout. It’s worth the wait, however, as I have organic sprouted flour for my bread. Thank you again, Ida! Please be sure to visit Ida at The Enabling Cook. You’ll love her website, recipes and tips. 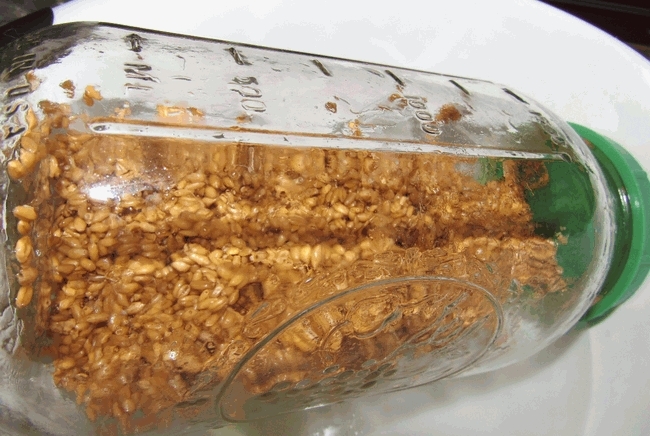 This entry was posted in Fermentation, How-To, Recipes and tagged recipe on June 29, 2015 by Homesteader's Supply. I’ve been thinking about my plans for the homestead a lot lately. It’s been more than a year since we moved to Tennessee to homestead and operate Homesteader’s Supply. With such a long list of things to do, money has to be part of the plan. 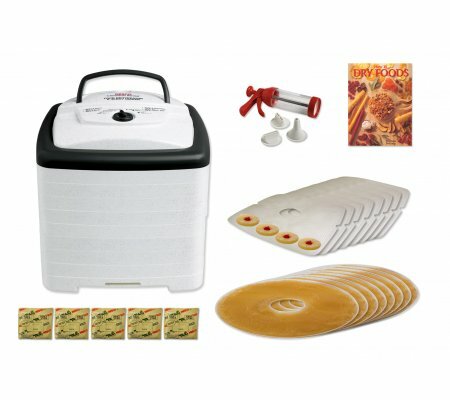 What can we do on the homestead without spending a ton of money this summer? Plenty! We shared Money Saving Tips for Homesteaders last winter, and a second part, More Money Saving Tips for Homesteaders. And now, more ideas! Summer money saving tips. Eat what you have and avoid the grocery store. Seasonal eating is your chance to gorge on what’s ripe now. I’m a little tired of rhubarb but now that the strawberries are starting to ripen and show up at farmers market, I can add a little variety. The garden is doing well. We’ll probably all be tired of eating the same things often before the next fruit or vegetable is ripe, but we can change it up. Try new recipes. Put up what you can for winter. Buy seconds from local farmers. You might save a few more dollars if you can pick the fruit or vegetable, or at least pick it up at the farm. Summer money saving tips. Build inexpensively, but build it well. When you put your building skills to use you should build sturdy and attractive things. In the long run it will last and you’ll be happy with your work. Co-own. If you need a piece of expensive equipment too often to rent but not often enough to own yourself, consider co-owning. I tried to rent a rototiller three times before I actually got one. I don’t need a rototiller often but when I do, it’s time sensitive. My friend and next door neighbor chipped in and together we bought a tiller. I thought about doing this with a snow blower now that I live in an area with some snow but that’s a little too time dependent. Wild harvesting is always going to be one of my most favorite money savers. I can pick gallons of berries each summer on a wildlife refuge for the price of a gallon of gas to get there and back. They’re $4 a pint in the grocery store. Summer money saving tips. My current favorite money saving tip for homesteaders covers entertaining. We are having a blast. A group of friends take turns hosting potluck. The host supplies the drinks. I didn’t want to buy plastic silverware and tablecloths and paper plats each time it was my turn to host. We sometimes have 30 people at a meal. That’s a lot of settings to buy and throw away. Here’s what I’ve done: Summer money saving tips. Buy inexpensive silverware and tablecloths. Check yard sales! Buy inexpensive plates, serving bowls and glasses. They don’t have to match. Until you’ve built up your inexpensive but nice tableware, BYOS. Bring Your Own Setting. BYOS, Part II. Bring Your Own Seat. Progressive meals are a lot of fun. Start with appetizers and move from homestead to homestead through the courses. The food doesn’t have to be fancy, just good. Enjoy the summer! Summer money saving tips. 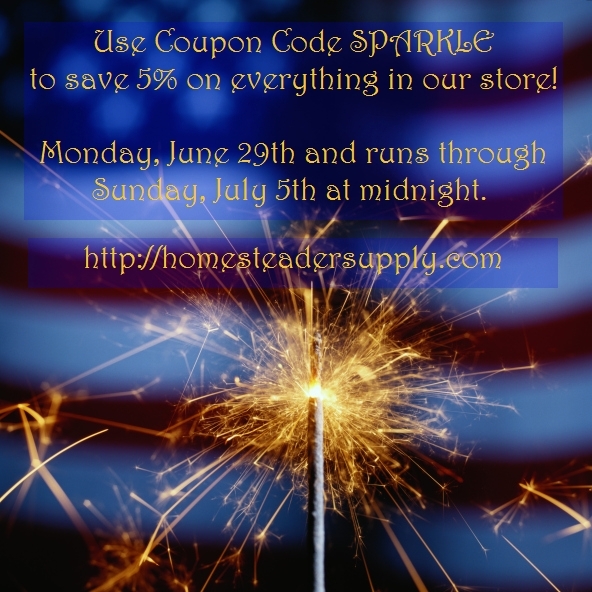 This entry was posted in Homesteading and tagged homesteading on June 22, 2015 by Homesteader's Supply. Have you subscribed to our free weekly newsletter? We send it out on Wednesdays. Hints, tips, recipes and other things you don’t see on the blog. Snap off the tough ends of asparagus, if necessary. Roast whole asparagus spears on a lightly oiled cookie sheet at 400° for 5 minutes. Remove from heat and allow to cool enough to handle. 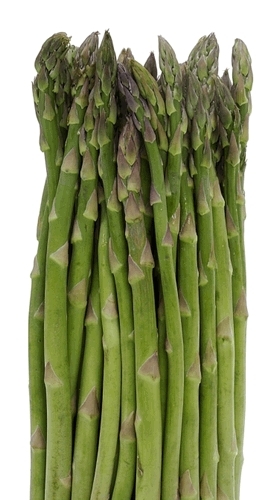 Cut asparagus into 1/4″ pieces. Turn the oven heat back to 375°. Line a pie plate with the crust and bake for 8 minutes. While the crust bakes, whisk together the chives, cheese, eggs, milk, salt, pepper and nutmeg. Remove the pie crust after 8 minutes. Place the asparagus on the crust and then pour the egg mixture over the asparagus. Bake at 375° for approximately 50 minutes. A butter knife inserted into the center will be clean when removed when the quiche is done. This is the recipe I’m following for tonight’s dinner. The photo caught my eye last week and I’ve been thinking about it since then. Baked Eggs With Asparagus. My go-to asparagus and eggs meal is quick and simple. If there’s a cooler day in the week I roast a bunch of asparagus at once and use some of it for this almost-a-non-recipe. Drizzle olive oil over a single layer of asparagus, sprinkle with sea or Kosher salt and Italian seasoning, and roast at 400° for 10 minutes. While the asparagus is roasting, get out the eggs and get ready to fry them. I especially like quail or Silkie chicken eggs for this dish because they are small. Two or three small eggs look nicer when plated with the asparagus but all means, if you are fortunate to have extra large goose eggs, go with it! In the last few minutes of roasting, pan fry the eggs until they are slightly under cooked for your taste. Move the hot asparagus to your plates. Top asparagus with a fried egg. The heat of the asparagus will finish cooking the egg. I love this served with a slice of oatmeal sourdough bread. 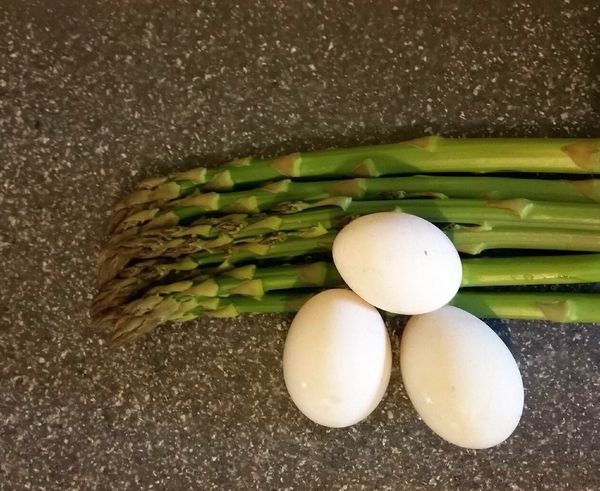 Asparagus and eggs – a late spring favorite! Joining in on the Blog Hop fun at The Flip Flop Barnyard! 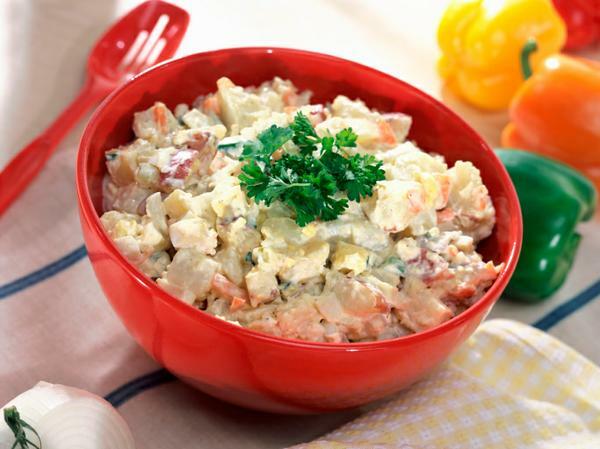 This entry was posted in Uncategorized and tagged recipe on June 8, 2015 by Homesteader's Supply. Rhubarb is a perennial that lasts for decades. One young plant will grow, spread out, and need to be divided about every third year for best growth. It’s a great perennial to share with friends. It’s one of the first vegetables to produce in the spring and always a welcome sight. As the days get longer and the temperature rises, rhubarb will “bolt.” It will send up a hollow flower stalk. You’ll know it when you see it; it doesn’t look like the usual stalk with a leaf. Pull the flower stalk to keep the plant producing well. Pull stalks, don’t cut them. Pulling the stalk stimulates growth and avoids a wet stump that can allow bacteria in. This recipe was my grandmother’s. She would be in her 90’s were she still alive. It’s tried and true, simple as can be, and versatile. Simmer water and sugar until the sugar is dissolved. This is known as a simple syrup. 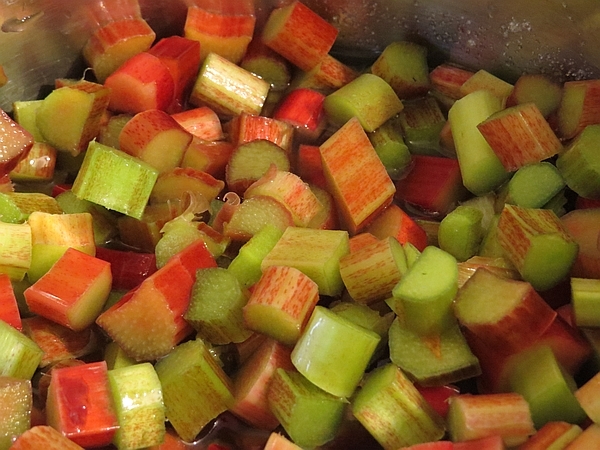 Cut rhubarb into 1/2″ pieces and add to the syrup. Simmer uncovered for 10 minutes, stirring a few times. 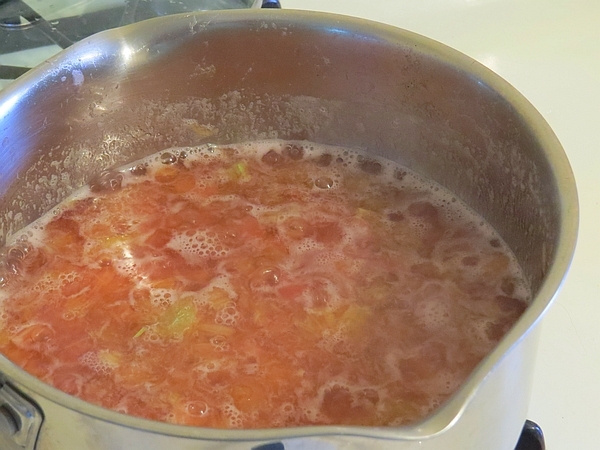 The sauce is done when the rhubarb is breaking down. Add cinnamon or nutmeg after removing the sauce from heat. 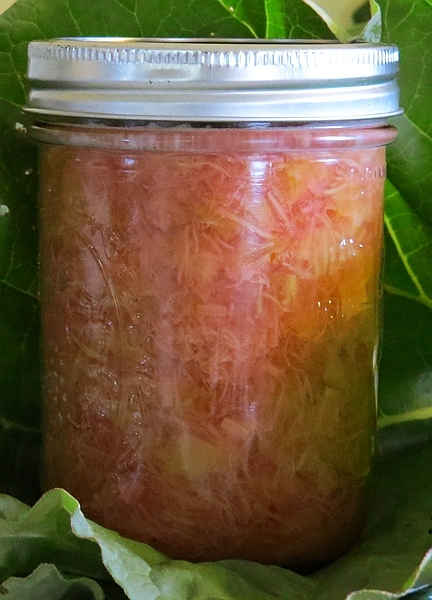 Rhubarb is low in pectin so you might want to cut down to 1/4 cup water after the first batch, or add a tablespoon of pectin according to the directions. Simple Rhubarb Sauce can be served on warm biscuits, ice cream, Angle Food cake and many other ways. It cans well and if you put up enough, you’ll be able to enjoy it over the winter. 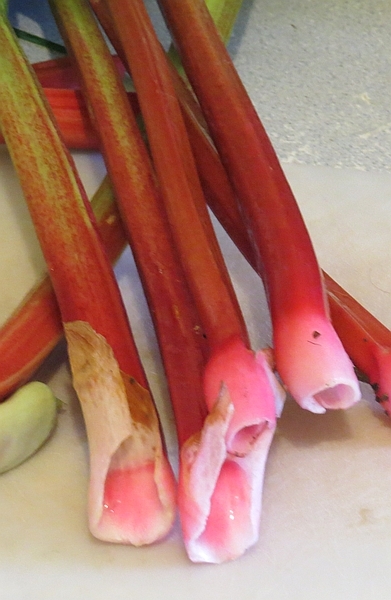 While rhubarb is a spring treat, it’s hardy enough for a winter dessert. We’re linking up with Maple Hill 101‘s blog hop. Join us! This entry was posted in Recipes and tagged food, garden, recipe on June 1, 2015 by Homesteader's Supply.